NetBet are something of a silent but sure bookie in the UK market. They have been around for a long time but don’t come up in conversation as often as their contemporaries. It’s odd because, actually, they deliver one of the best websites out there with decent odds to boot, and they aren’t lacking in depth or range. 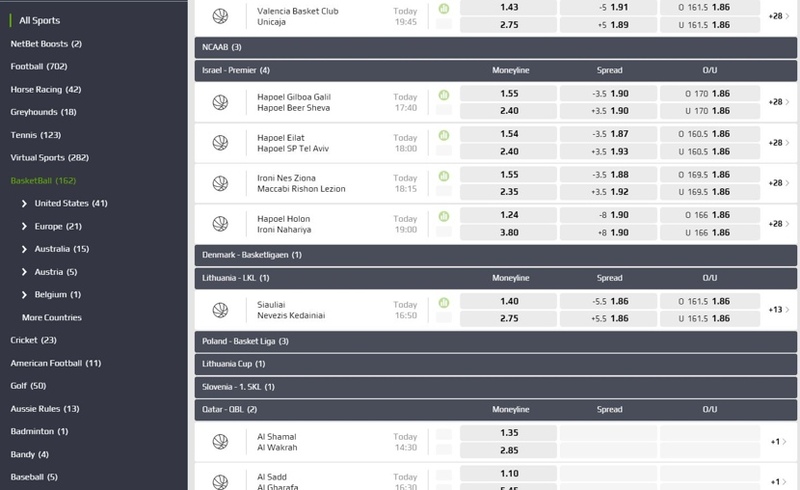 They offer something a little different to a lot of sportsbooks by way of more obscure European sports and markets, as well as some genuinely interesting and experience enhancing betting features. Their live betting capabilities are first class and when it comes to payments there isn’t much to complain about either, aside from some unnaturally long processing times, but if you are the patient sort this is a useful bookie that should be considered as an addition to your portfolio. Customers form the UK who join and deposit (with a method other than Skrill, Neteller or PayPal) and bet £10+ (at 1/2 (1.50)+) will get a matched free bet equal to their first bet amount (100%) from £10 (requiring a £10 deposit) up to £25 (requiring a £25 deposit). The free bet token must be used at 1/5+ (1.20)+ within 7 days. As a bookie with a European focus, NetBet run a sportsbook that is less predictable than a lot of other brands. You won’t find anywhere near as many events as some of the big boys provide, we may as well make that clear from the start, but you will often find events from afar that other bookmakers don’t list at all – and they usually come with a good depth of markets. The sports list is 30 strong and contains a surprising number of Winter Sports as well as a few options like Bandy, Surfing, and Volleyball that UK focussed bookies may not include. You will never miss out on popular UK fixtures, either, although there may not be quite the number of betting lines you are used to. Don’t let that put you off, though, there are still 100+ for National league football fixtures, for example, and some of the extra features like Add2bet and SnapBet add a great deal of enjoyment which many other bookies can’t match. The other great thing about NetBet is that they tend to rank quite highly for good value odds, especially when it comes to European football matches, and regular NetBet Boosts (price boosts) and promotions can improve things even further. There is also a comprehensive stats and results tool to help you make some shrewd decisions. It’s not the best place for the horses or the greyhounds, although they are available for the casual punter, but if these are what you usually bet on you will be better served somewhere else. This is a professionally designed betting tool and interface that is constantly evolving in real time, and it feels very exciting to use. The red and green pulsating arrows indicate odds going up and down, and the whole thing feels like a stock market traders’ platform. It’s incredibly smooth and responsive, you won’t end up frustrated that the site can’t keep up with you, and the in-game graphic is probably one of the best there is both in terms of appearance and functionality. There are always plenty of fast markets available and you can quickly get to what you want using the market categorisation options for each event followed by the collapsible menu bars to narrow things down further. There is also a good deal of in-game information available as well as an event schedule so you can plan your time. Once you open an event you can even keep track of the live scores of other fixtures from other categories, and quickly jump over if one takes your interest. It means you can make your live betting experience as laid back or as intense as you want it to be. 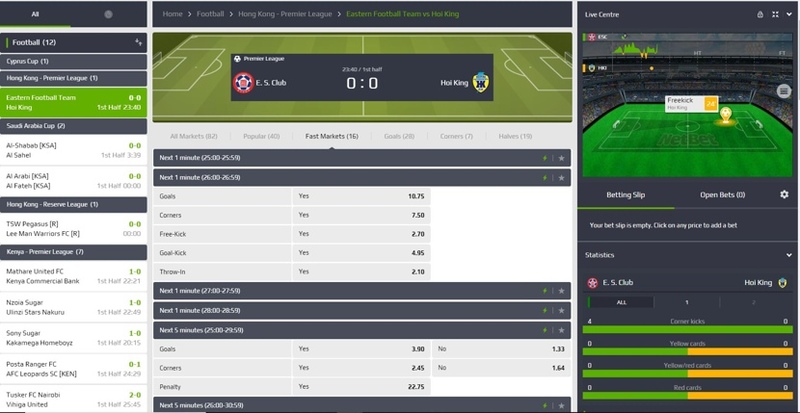 You won’t be able to live stream and will find more in-play markets at some other bookies, but again there are more than enough for most people here, and you almost certainly won’t be using such a good product anywhere else. Since they have players from all over Europe, the payment methods on offer are numerous. We have only mentioned those relevant to UK customers but there are many more besides. One interesting option that you hardly ever see is Bitcoin, although it is via Neteller that you have to use it, but still, the option is there if you want it. High rollers may find the low deposit maximums annoying, but usually, you can talk to the bookie in question if you want to deposit unusually large sums of money and make an arrangement; most people will be just fine. There are no fees attached, but the processing time their end is 48 hours which feels excessive, and some methods could take up to 12 days! That seems crazy in this day and age. 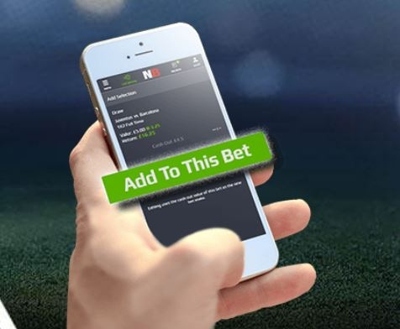 NetBet do allow punters to cancel withdrawal requests for up to 24 hours, which would earn them a slap on the wrist from us, except they allow you to turn this option off so you won’t be tempted. 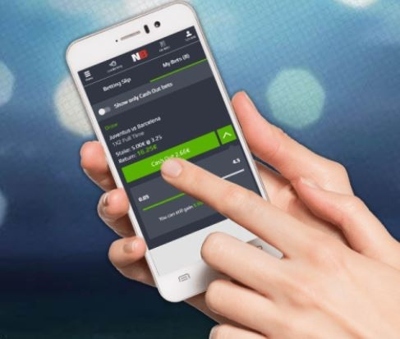 NetBet are always thinking of new ways to spice things up or improve the betting experience so they have a good deal of extra features available. As well as those listed below there are also regular promotions including acca boosts and weekly prediction prizes, a great blog, the results service and in depth stats available for many fixtures. There is also a Bet Maker, which is a rubbish name but does exactly what it says on the tin. Quite simply, Add2Bet allows the punter to add a new selection to a pre-existing bet. 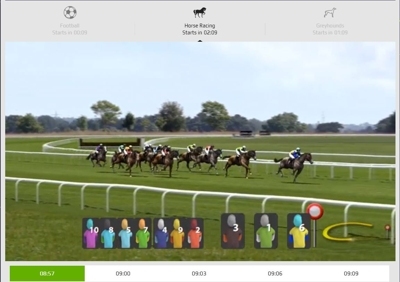 If you have more than one bet laid you can choose which bet to add the new selection to as well, so it gives the customer the opportunity to play around and sculpt their wagering activity somewhat, and take advantage of things as the situation develops. 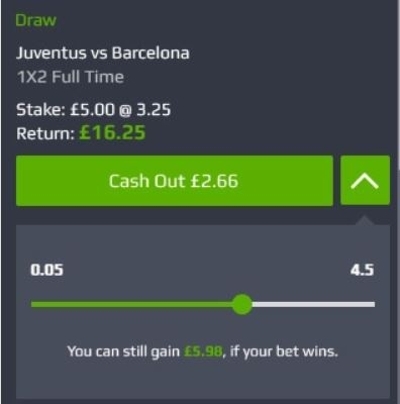 You can only use this feature with bets that have cash out available because by adding to the bet you are essentially cashing out the original bet and using the cash out amount as the new stake. So use it wisely. This one is only available on mobile and tablet but it’s designed for use in-play so chances are you will be using a device anyway. It’s a doozy. 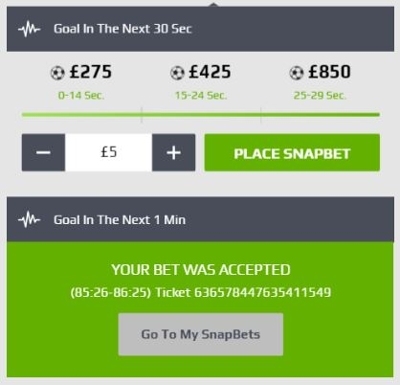 During a football match, you can bet on a goal being scored in the next 30 seconds, 1 minute, 5 minutes, or 10 minutes; whichever option you choose will be split into three periods. The closer to the end of the time limit the goal is scored, the greater your winnings. So, for example, if you bet on a goal in the next 30 seconds, the first 14 seconds might be worth £30; 15-24 seconds might be worth £50; the final 5 seconds could be worth £100. This is a guaranteed adrenaline booster, and the odds are updating all the time so your timing has to be just right. A relatively new addition for NetBet, and with only Football, Horse Racing, and Greyhounds to choose from. However, if betting on non-existent football matches floats your boat then these are actually quite good. New events start every 3 minutes. Graphically it can feel a bit grainy, like watching telly in the late ’90s, but the commentary is really good on the football with some interesting camera angles we haven’t seen before too. The play and set pieces are also complex and unexpected. The racing doesn’t compete quite so well but there is less to play with to be fair. We noticed some commentary issues like repetition or the audio not quite matching the visuals, but on the whole it was decent. 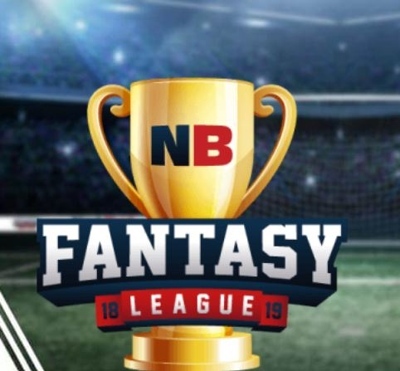 Fantasy football leagues aren’t anything new, but playing through NetBet could earn you weekly and monthly prizes in the way of free bets. The end of season prize is obviously the main event, but there is plenty to keep you involved along the way. Other prizes include team kits of your choice for the next season, and NetBet will hit you up with tips, stats, and analysis so you can immerse yourself in the competition. It’s a good way to get a group of mates together throughout the season and brag about successes as well as laughing at each other’s misfortunes. Not only is this available at NetBet but they have built other features around it, like Add2Bet mentioned above. It’s easy enough to do, the hardest part is figuring out if it’s a good idea or not. If you put £10 on Grimsby Town FC to win (it does happen sometimes) and they are 2:1 up at 85 minutes but the other team look like scoring, you could cash out early at reduced odds but for a guaranteed profit. Equally, if Grimsby were 2:1 down at 85 minutes (which is the more likely scenario, let’s be honest) you might decide to cut your losses and cash out early leaving you no chance of winning the bet, but recouping a small portion of your stake. Building on cashing out, NetBet will allow you to cash out a part of your bet while leaving the other part in at the original odds. This way, in the right circumstances you can cover yourself and still make a profit. This is available on singles and accumulators (do check though, it’s not always an option) and is a great way to stay in control and adapt with the game you are betting on. You can also play with the amount of your stake you want to cash out. It works on a sliding scale, so you could cash out £4 of your bet on Grimsby and leave the other £6 in, for example. NetBet might specialise in sports betting but there is more to them than just that. The igaming offerings at NetBet are comprised of the Casino, Live Casino, Vegas, Poker, and Lottery areas. They host top games from a number of well-known software providers encompassing slots, jackpots, blackjack, roulette, and a few other table and card games. The live casino is powered by Evolution Gaming, and if you know anything about this area of online gambling you will understand why that is a good thing. This is all available via mobile or desktop, while the poker client is a downloadable product. 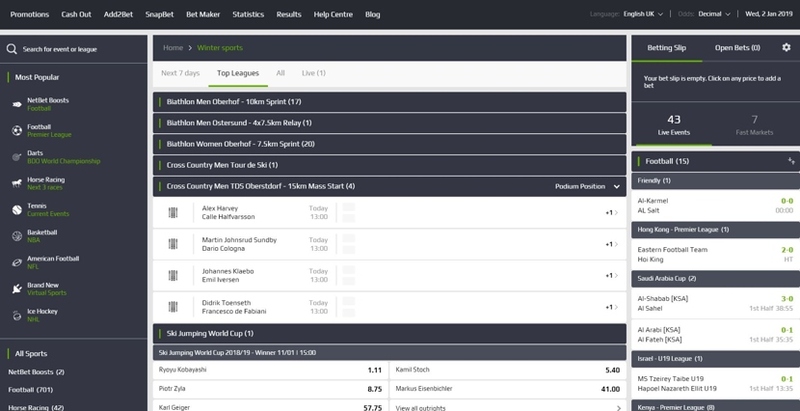 We really like the NetBet site, it feels stylish and fresh with plenty of space for each section and feature to breath. Varying shades of grey leading to white are used for clarity between sections and info box’s, with touches of green for emphasis. This high end feel is down to the SBTech platform the site runs on. It’s incredibly capable, feels robust and light on its feet. SBTech are a multi-award winning Bulgarian firm known for developing innovative betting products and allowing great diversity from one site to another. In terms of navigation you should have absolutely no issues at all. Quick links to popular choices as well as an A-Z of sports or a search bar will get you to where you need to be in no time, and all of the useful features and tools are listed for easy access. Everything is contained within a single interface, so once the page loads you can snap instantly from one selection or category to another. The only time you will need to load a new page is if you want to go to another area of the site entirely, the Casino for example, or if you want to read the blog etc; even banking and the help centre open on top of the interface so it is just as you left it when you finish what you are doing. When exploring a particular sports category, you can list the events by top leagues, all leagues, live events, or see them in a calendar view over the next 7 days. Further to this, all options are collapsible and expandable, so the screen can be as tidy or untidy as you want to make it. The mobile site doesn’t quite live up to the desktop site but it’s not a million miles off. There is an app as well but there is no noticeable benefit to using one over the other, they are identical as far as we could tell so it just comes down to personal preference. A slider bar offers up the most popular choices as well as a link to all sports, although this can also be reached via the menu button which is your access point for pretty much everything else except your account management. You can also transition between NetBet’s different products from here. It’s straightforward to use and just as snappy as the desktop site, but intermittent page loads from one category to another slows things down a bit. We found using the built in back button where possible was more effective than going back to the menu. In terms of layout it mirrors the main site wherever it can, so the way the bets are displayed and the collapsible bet types etc are all the same. There are some nice little touches that show forethought, too. It’s inevitable on the small screen that there will be a certain amount of scrolling to get through all of the information, for example. 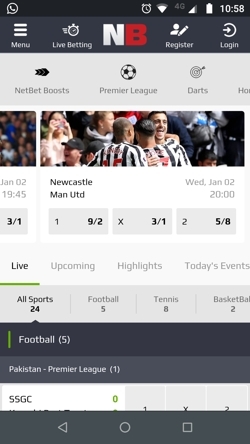 NetBet have added a simple ‘back to top’ button that shows up once you have scrolled so far to make it slightly less of a scroll-a-thon. It’s a small thing, but it’s actually very useful. Your betslip will only pop up as a round icon when it is in use which saves space and it is satisfying to use. The slip will float in from the side when you tap the icon and a simple tap elsewhere on the screen hides it again. NetBet were fairly quick off the mark, entering the industry back in 2001 from their base in Malta; they might be the only online gambling company in Malta who didn’t move there from somewhere else for a tax break. They are a European bookie with a good foothold in the UK market, although they do seem to fly somewhat under the radar in the UK for some reason. Perhaps it is because their sponsorship deals tend to be with European clubs like AS Saint-Etienne and GFC Ajaccio – although they have also sponsored West Brom and Hamilton Academical in Scotland. The sportsbook is a fantastic product but they run an equally well manned casino and poker product. In fact, in 2014 after the merger with Poker770, NetBet Poker could boast over 2million registered players. If you have started to feel like all bookies are pretty much the same then NetBet could be just the tonic you need. 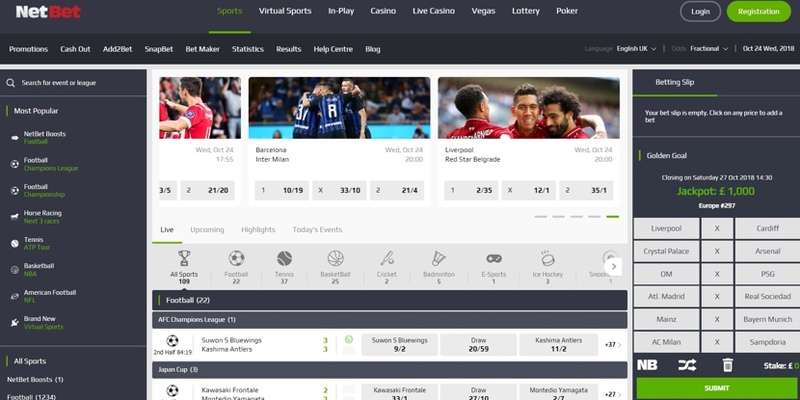 They are often overlooked in the UK yet they provide an excellent sports betting platform with a lot of extra features to keep life interesting. They are especially useful if you have an interest in European football and sports in general, and you may find bets that your mates will be jealous of. If you feel like you need 10,000 different events each day to keep you satisfied then go elsewhere, but if you prefer to keep things a little more manageable you will find everything you need for mainstream betting with some interesting extra’s thrown in. Having won awards in this department, it’s safe to say that customer service is something NetBet take seriously. It’s not 24/7, but the quality is what stands out here rather than the quantity. If you open the help centre live chat will immediately become available via a small tab at the bottom. It’s one of the best live chat clients we have used, with a photo of your support agent to make it feel like a personal service, as well as the ability to rate the chat. It connects almost immediately too. A Contact Us button holds all of the other details, such as a phone number and an email contact form. The number is only live from midday to 8pm, which is a comparatively small window of opportunity, but the staff are fantastic and other methods are available outside of these hours. 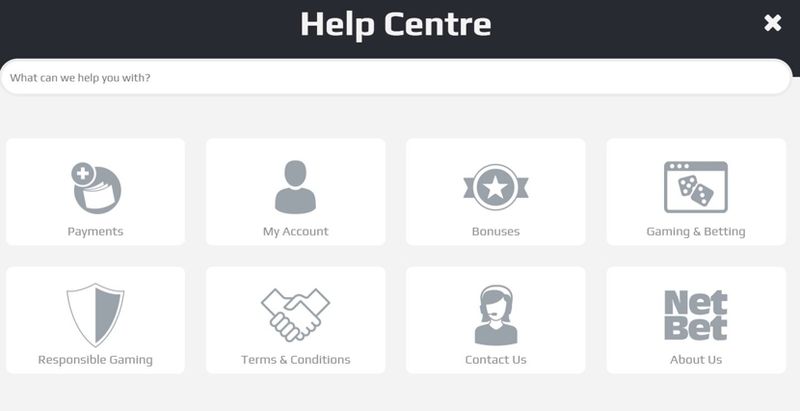 The help centre itself is split into sections which all hold their own subcategories and specific FAQ’s. This breaks the options down into manageable numbers so you will only scroll through information relevant to your query. It’s smooth to use too, just as high quality as the rest of the site. Live Chat – It’s only available from 9am to 11pm but it’s a good service when it’s live. Find it via the Help Centre. Email – support@netbet.com is the direct address, or you can use the contact form. Phone – Call +44 020 3608 6024 between 12:00 and 20:00 to speak to a real life human being. @netbet – This humourful account is updated regularly each day with news and promotions, well worth following.